Glider pilot Scott Wolf from Sugar Grove flies an ASK 21 glider over Hinckley, Ill.
Wolf is a member of the Windy City Soaring Association. As autumn nears and the ground begins to cool at night, a growing cadre of self-described "weather freaks" begins scanning the skies for signs of thermals, the rising air currents that boost birds and their human imitators, gliders. Gliding, or soaring, has deep roots in Chicago: The ChicagoLand Glider Council was organized in 1937, and some of its member clubs go back further. With aviation fuel prices skyrocketing and gliders becoming more sophisticated, this tiny corner of the flying world is attracting a surge of new enthusiasts, experts say. Based at the Hinckley Airport, about 40 miles west of Chicago, the Windy City Soaring Association is the latest addition to the area council. Windy City was organized in 2003 with 12 members; it now has 68. At Windy City's office, a trailer alongside the airstrip, members watched take-offs and landings on a recent weekend. A ground crew helped pilots roll their sailplanes onto the airstrip and hook them to a tow plane with a long nylon rope. Compared with the roaring crop-dusters that tow them, the fragile-looking sailplanes become airborne almost immediately and seem to float down the runway. Tim Hurst of Aurora had just returned from a flight, a gift from his family for his 40th birthday. He could hardly contain his excitement. "You're in a recliner chair just looking around!" Hurst said. "We caught a thermal and spiraled up!" Caelie Skalniak took her first ride in a glider in 1982, a birthday present from her husband. "Now, you can't keep me out of the air," said Skalniak of Mt. Prospect, one of the three female pilots in the Windy City Soaring Association. Nationally, about 2,000 gliders are registered in the U.S., said Denise Layton, acting executive director of the Soaring Society of America. Based in Hobbs, N.M., the group has about 12,000 members, said Layton, who reported an increase in membership in recent months. "We are sort of a secret," Layton said. "Not many people know about soaring." Despite its appeal, flying in gliders has risks, according to statistics from the National Transportation Safety Board. In 2003, the last year for which data are available, six people died in glider accidents in the U.S., officials said. Gliders have about three times more accidents than typical single engine planes, according to the NTSB. John Ehrisman, a pilot and club member at Windy City, said the hazards have been reduced due to improvements in materials and design. Modern gliders are made of fiberglass and composite materials such as carbon fiber and can stay aloft for hours and soar hundreds of miles, he said. The Illinois record for hang time is more than 10 hours set in 1993. Passengers and pilots still wear parachutes, primarily to satisfy Federal Aviation Administration rules, Ehrisman said. With its flat, open terrain, Illinois is a perfect place for gliding, said Scott Wolf of Sugar Grove. An emergency landing in a soybean field, when the wind suddenly gives out, does happen occasionally. "The beauty of this area is you can land out here and walk away because the countryside is so benign," Wolf said. "The cornfields just sort of ding up the glider." Barry Van Wickevoort-Crommelin, who flies Boeing 767s for American Airlines. Like many glider pilots, he hauls his aircraft around the country for demonstrations and meetings. With modern gliders, wings bolt on so they can be stored or shipped easily. "I call this true flying," said Van Wickevoort-Crommelin, who lives in Hoffman Estates. Van Wickevoort-Crommelin said he began his aviation career flying gliders in the Netherlands as a boy. Europe is the glider capital of the world, and Germany, in particular, has led the way in the design and manufacture of gliders, he said. 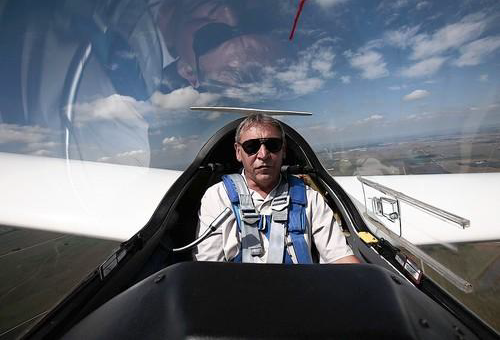 "There are more glider pilots in Germany than there are in North and South America combined," he said. Wolf, 55, said the allure of the sport is irresistible. He moved to Sugar Grove just so he could be closer to Hinckley, he said. "It's the closest thing to being a bird," Wolf said. During a recent flight, Wolf nudged the control stick and his two-seat sailplane banked left, its long tapering wings cutting through the warm air rising from the green farmland. Clouds drifted across the sky, trailing wispy filaments. Below, the earth stretched out to the purple rim of the horizon. A moment earlier, the sleek glider was buffeted as it sailed through a thermal and instantly was lifted 100 feet. Flying at 4,000 feet, other gliders were soaring in wide, sweeping arcs, searching for more of those magical thermals. "The first time you catch a good thermal and climb thousands of feet, you just kind of sit back and chuckle," Wolf said. "There's nothing like it."